Last Friday my family went on a magical adventure! We went on a BB Riverboats sightseeing cruise called Pirates on the Ohio. This 1 1/2 hour cruise in a paddleboat up and down the Ohio was a wonderful way to spend a Friday afternoon with my kids. The cruise runs on Fridays through September 2nd. While on the ride, your children will receive pirate hats, eye patches & a treasure map. 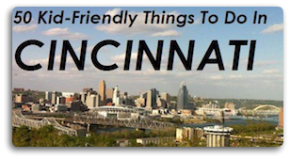 They will take part in fun pirate activities all while taking in the beautiful sights on the Ohio River. I took all four of my kids, and I was worried that my eldest, Ella wouldn’t be interested in the games and activities, but they all loved it. Even the baby got in on some of the fun. If you have a child who isn’t that interested in pretending to be a pirate they can still enjoy the scenery & watch the boats as you cruise the Ohio. This cruise was fun for kids AND adults. I loved watching my kids immerse themselves in pretending to be pirates. I think that what makes this cruise so fun is the staff working on the boat. They dressed as pirates, talked like pirates, and convinced the children that they themselves were pirates. You could tell that these staff members were having fun and wanted the kids to have fun too. They were engaged & excited which encouraged the kids to let loose and have fun. The first thing you have to do to become a pirate is get a tattoo and your face painted. Then you go out on the deck to do the Limbo. And then the kids pirates had a water fight. Another rite of passage for the young pirates is to mop the deck. And the final test of for the pirates was to walk the plank. Even babies had to walk the plank 😉 After the kids walked the plank they went to meet the captain and find their treasure. After the organized pirate activities we did some more boatwatching. The captain of the boat shared lots of stories and tidbits about the area while he piloted the boat. And we did some more dancing ~ they were playing the best pirate dancing music during the cruise! What a day! What an adventure! While we were disembarking the boat, the kids were asking when we could go again. And all weekend long they were still bubbling with excitement, telling everyone they met about how they rode on a pirate ship and became pirates. If you are interested in going on a Pirate Cruise, call BB Riverboats at 859-261-8500. 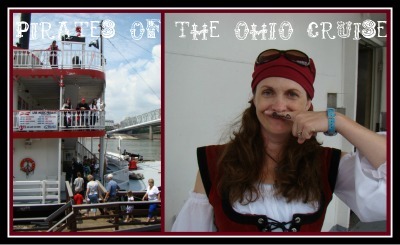 The Pirates of Ohio cruise is $15 for adults and $12 for children. The cruise is on Fridays through September 2nd from 3:00 – 4:30. Great pictures. This looks like so much fun. Ahoy Matie!